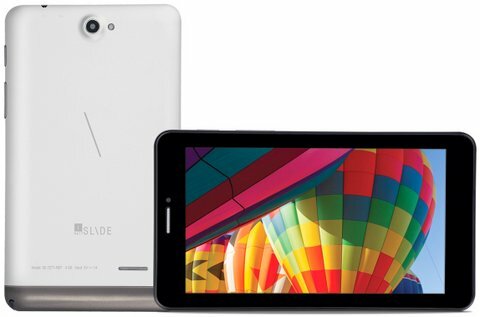 iBall Slide 3G 7271 HD7, is now available from ebay India for INR 8,999. The new Slide 7271 HD 7 has 7 inch capacitive 5 point multi touch screen display with 1024 x 600 pixels resolution , Android v4.2 OS and Dual SIM access. It gains the strength from 1.3GHz dual core CPU based on A7 architecture. It will compete with recently launched OPLUS XonPad 7 and Simmtronics Xpad Turbo 7 which features 1GB RAM, quad core processor and 5MP rear shooter. The iBall Slide 7371 3G features 512MB of RAM, 4GB on internal storage and 32GB expandable memory. To make the device alive there is 3000mAh battery. You can surf 3G internet via inserting 3G enable SIM card in the phone. It packs with 1 2MP rear camera and a VGA front camera. The Ram is bit Low but you can not expect much at this price tag. As its is a Dual SIM tablet, hence you can make voice calls. Talking about the connectivity options, there is 3G, WiFi b/g/n, Bluetooth, GPS, FM radio and micro USB with OTG support. The iBall Slide 3G 7271 HD7 is priced at RS 8,999 MRP and is available from online retailers. The company would launch it officially by the end of this month.